White is still the rage, but surprising hues are gaining. News flash: Painted cabinets will still be on-trend in 2019, but not all of them will be white. 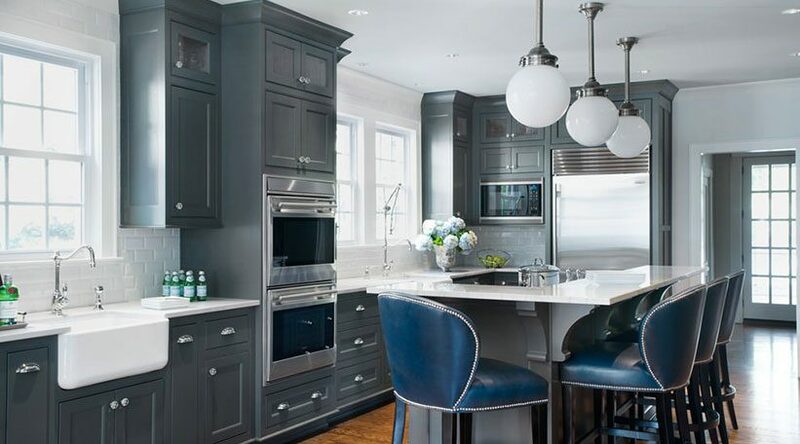 While white has dominated the cabinetry in kitchens and baths, more colorful options are on the rise, from pale yellows and greens to mid-range blues and reds to deep shades of charcoal and even black. You can expect these bolder cabinet colors in many of the most fashionable homes next year. Of course, this doesn’t mean that white is “out.” Bright white, soft white and off-white are still popular cabinet colors and will be for many years to come. There’s good reason for this: White makes a space look clean and bright. It works well with other colors and with a variety of decorating styles. And it makes small spaces look roomier—perfect for tight galley kitchens and half baths. It allows you to greater customize your kitchens and baths and to express your own true style. It adds to your home’s “flow,” an important design concept, as you tie these rooms into other areas of the home. And it allows you to set a mood. For example, a kitchen with red cabinets can create some “spice” and excitement; a bath with blue cabinets will feel more spa-like. Another rising cabinet color is yellow, which is being used throughout the home, not only as pops of color but as part of the main decorating scheme. Yellow is making its way onto cabinets in a range of beautifully sophisticated tints. Like white, yellow can make a room feel bright and is a good choice in rooms where there is a lack of natural lighting. One word of caution: Yellow can be overdone. There is a something in color psychology called “yellow fatigue,” a phenomenon that makes yellow especially wearisome as we age. If you’re considering yellow for your cabinetry, you might use it sparingly—such as on a top or lower bank of cabinets—or in a softer shade, such as chamois or buttercup. On the other end of the spectrum, black also is a trending cabinet color, usually appearing in a flat or matte finish. The look is extremely high-end, especially when juxtaposed with brushed nickel or gold fixtures. In general, black should be saved for larger rooms and in areas that have plenty of light sources, since black absorbs light. Of course, you don’t have to paint all of your cabinets at once to achieve the benefits mentioned earlier. You can paint just your upper or lower cabinets, a kitchen-island or another piece of cabinetry in the room—whatever suits your fancy. Charcoal is stunning with deep reds and blue-greens. It also works well with the white family, from brighter hues to ivory. Blues and yellows look especially fresh with white and are a classic pairing when used together. Warm, deep reds take on an air of sophistication when paired with warm whites and creams. Neutrals, like olive and gray, are beautiful accompaniments to brighter hues. They also pair beautifully with wood stains. This pairing technique is a great way to get used to a new cabinet color without committing to the entire room. What’s more, you don’t have to worry that this look will go out of style any time soon. A mix of finishes is perfectly on-trend—and perfect regardless if this is the look you desire.